Amateur astronomy has always suffered with one central delusion. It’s always been the case that in order to maintain a healthy enthusiasm for the hobby, you have to be able to lie to yourself under rather difficult circumstances. Let me set the scene. Excited, you slowly peer into the eyepiece, and what do you see? You see a white splotch against a dark gray background. With lots of stars around it. Where are the clouds of dust? Where are the white puffy spirals? Where is the color? They certainly are not in your field of view. Those fantastic vistas are the result of hours of work and painstaking long exposure photography. They can be constructed because image capture devices (most recently, CCDs) can accumulate visual information over time, and are not handicapped by the human eye’s need to be real time. You, the visual observer are denied this fantastic splendor. Instead, it must remain locked up in your imagination. Any satisfaction that you gain from this experience does come not from the actual visual spectacle. Rather, it comes from the idea that what you are looking at is a magnificent object represented by photons that have travelled hundreds or thousands of years to reach your eyeball. This, is the big lie behind amateur astronomy. Don’t get me wrong, I don’t mean to disparage the activities of the backyard astronomer. I have spent more than my share of time participating in this particular act of self delusion. I have spent hours hunting down the tiniest of fuzzballs (much smaller and dimmer than M31) in the dead of winter and at the time I loved it. If I had the time and the sky to do it tonight, I’d probably love it just as much. But, what I have discovered recently is a class of devices that allows us to do away with this big lie. Finally, armed with a reasonable telescope and a not unreasonable amount of time, you can actually see all those faint fuzzies for what they really are. This object is famous for the dust lanes and star clouds and huge spiral arms which for the most part are only visible in huge telescopes or in long exposure images. But now, with this super sensitive CCD video camera, you can get images like this in 20 seconds. Another wrinkle in this piece of equipment is that it is equally impressive under light pollution. If you don’t believe me, go to and check out the video archives of various observing sessions that Mallin has recorded from his home under the light dome of Ottawa. They are linked off of the Mallincam web site. It’s pretty clear to me that the combination of modern computerized mounts and these cameras will completely change the face of amateur observation, especially from the cities and the suburbs. What this combination hardware has the potential to let you do is “see” these objects without needing to be able to see them. The telescope (or your laptop) knows where the object is in the sky, and the camera can help to compensate for the fact that the sky glow makes the object too dim for you to actually see on your own. 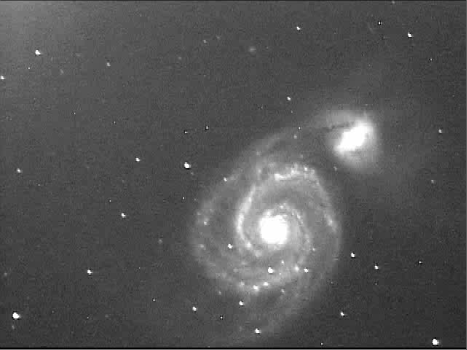 Of course things will always be more impressive under dark skies and with large telescopes. And, one can’t discount the the nostalgic romanticism of actually seeing the object with your own eyes. But the reality of the world is that un-aided visual observation is simply not practical for a huge percentage of the astro-dork population in the modern world, and I can’t imagine a better tool than one of these nifty cameras for maximizing one’s enjoyment of time spent in the dark under the stars. For the non-astronomical dorks out there, the M-numbers that I keep spouting refer to the Messier catalog of objects that were collected by the French astronomer Charles Messier in the 18th century. There are around 100 of these objects, made up of nebulae, stat clusters and galaxies. I stole the M31 photo off of some guy’s flickr page. 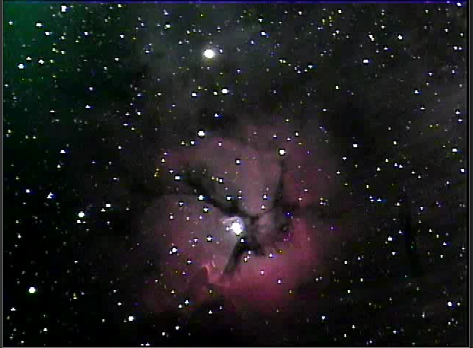 The screen grabs I took were from a video broadcast on the Night Skies Network web site. Mr. Mallin himself had set up his telescope, the camera, video capture software and a small laptop and was transmitting everything the telescope captured to a flash video stream. Truly that’s living in the future. I have only recently discovered this remarkable equipment, but I am late to this party. You should go to Uncle Rod’s web site where has covered this material better than I ever will. He also has the advantage of having actually used the equipment, rather than, for now, only daydreamed about it. Anyway, time to find a telescope. Maybe in a year or so when I after I build up the strength to withstand the mocking.